Out-of-pocket health care costs for seniors consumed over a third – 37 percent – of the average Social Security check in 2010, according to a new analysis by Social Security Works of data from the Center for Medicare and Medicaid Services. The vast majority of seniors and people with disabilities live on modest, fixed incomes. Median household income for seniors is $34,000, and for Social Security Disability Insurance beneficiaries just under $30,000. Our Social Security and Medicare systems are designed to provide seniors and people with disabilities with a measure of economic and health security, as well as predictability with regard to their budgets in retirement – insurance protections which they earned by contributing to Social Security and Medicare throughout their working years. Seniors’ high out-of-pocket expenses, however, undermine their economic security in retirement. 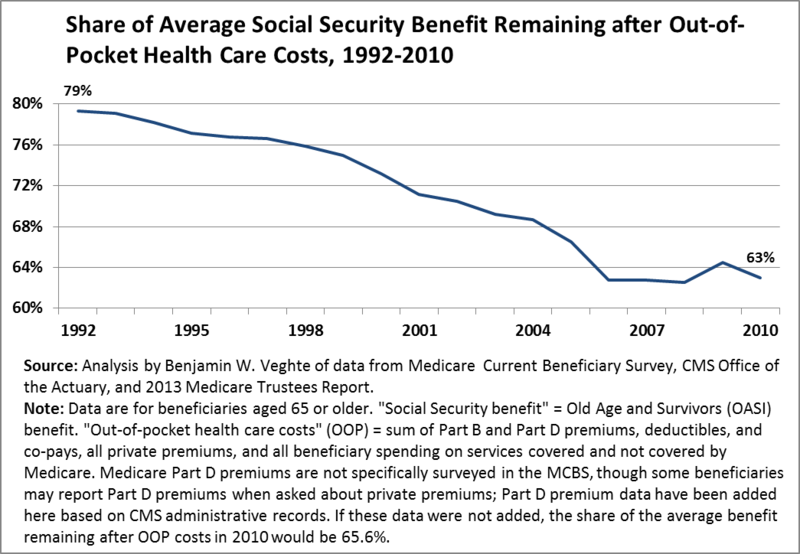 Social Security benefits were never intended to go mostly toward medical bills. Yet today, even with Medicare (including the prescription drug coverage – Medicare Part D – which took effect in 2006), out-of-pocket health care costs are well on their way to eating up half of the average Social Security check of seniors and their surviving spouses. In 1992, after beneficiary spending on Medicare premiums, deductibles, co-pays, all private premiums, and all other services covered and not covered by Medicare, nearly 80 cents of every dollar in Social Security benefits remained to cover other living costs. Today, however, less than 65 cents of every dollar in Social Security benefits remain to meet living expenses besides health care – with a downward trend. 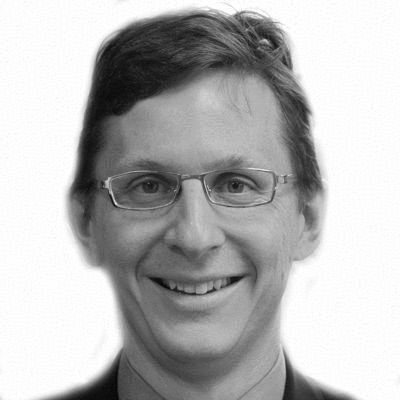 If the cost-shifting proposals on the agenda now – such as requiring ill seniors to have “more skin in the game,” a crude term for them bearing a greater share of rising provider costs, or increasing Medicare premiums for middle-class beneficiaries – become law, this would cut net Social Security benefits even further. What proponents of further cost-shifting misunderstand is that the cost problem we face is not a Medicare problem – Medicare is actually better at controlling costs than our private health care system. The problem, rather, is that our system of health-care provision isinefficient: we spend twice as much as those of similar countries, with worse health outcomes. The New York Times‘ Elisabeth Rosenthal, and Time Magazine‘s Steven Brill, have published revealing exposes detailing the manifold perverse incentives and inefficiencies in our health-care system, and showing how these are perpetuated by an army of provider lobbyists in Washington, DC. True courage on the part of policymakers would be demonstrated by taking on these vested interests to improve the efficiency of our health-care delivery system – which would be a boon to the entire economy – rather than asking seniors and people with disabilities to bear an ever greater share of the rising amounts billed by providers. For example, we could allow Medicare to negotiate with drug companies for lower prescription drug prices, which is prohibited under current law. Medicaid and the Veterans Administration already do so, as do most other countries’ health care systems. Allowing Medicare to also use its market power on behalf of beneficiaries could save the federal government between $230 and $541 billion – and beneficiaries another $48 to $112 billion – over 10 years. And if policymakers want to ask upper-income Americans to contribute more to financing Medicare, they should do so through progressive income or payroll taxes on working-age Americans, not higher premiums for seniors living on a fixed income. And they should limit their proposals to the truly upper income, not those with incomes of $47,000. The vast majority of America’s seniors live on modest, fixed incomes. They have paid into Social Security throughout their working lives. Congress has a sacred obligation to protect them from out-of-control health care costs in retirement. There is ample scope for improving the efficiency of our health care system. We should control costs, rather than shifting them onto our seniors and people with disabilities.